To start a new pair of surfboots. 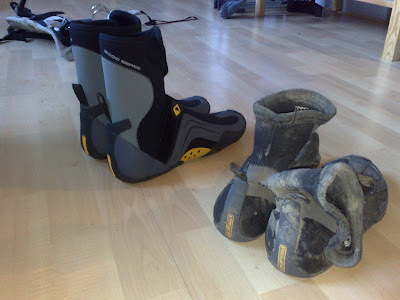 My old NP 3000-serie boots were a bit used... The grip was completly gone, but more important the boots had several holes. Since we have again ICE in the Netherlands, I chose for NP 5000-serie 6mm boots! Never cold feet again! A little tip: when you put your surfboots on, don´t pull hard on the boot entry. Put them on like a sock. Otherwise you will end up just like me with 2 big holes in the back of your surfboots! Also I finally bought a new windsurfingharnass! At Kater funsports they selling a bunch of older Neilpryde models for a very nice price! So I tried a few and one fitted really well. 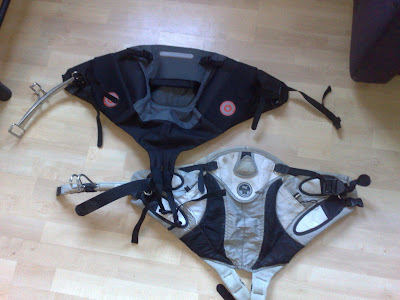 Really happy, because my ´old´ harnass a North Sails Move was just a little bit to big. In the summer (thin clothing) I had sometimes problems with sitting in harnass and giving downforce. Both Neilpryde as North Sails are size Medium, but North is a bit bigger.